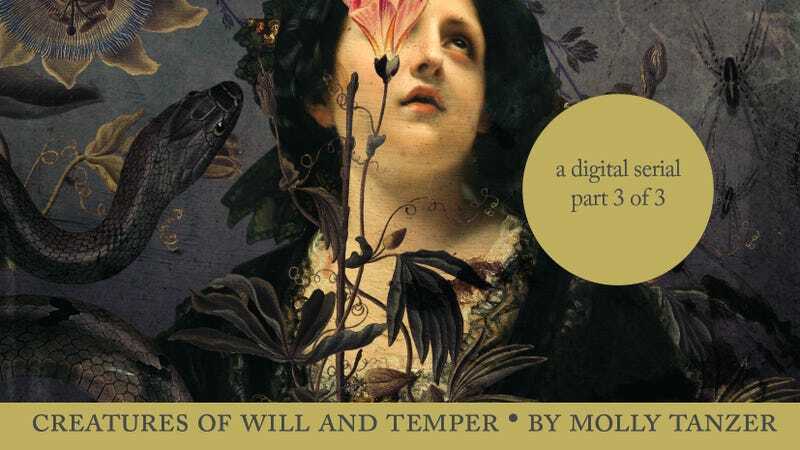 io9 is proud to present the third (and final) segment of our free serialization of Molly Tanzer’s excellent novel Creatures of Will & Temper. It’s the story of two sisters who learn that beneath Victorian England’s veneer of absolute propriety lies deceit, decadence, and demons alike. Missed Parts One and Two? Well, we’ve got some links for that. As we begin Part Three of Creatures of Will and Temper we find Evadne recovering from her long night of fighting demons and Dorina recovering from exertions of a more personal nature. But never fear, cherished reader—there are still many adventures, public and private, still to come! Was this ending a happy one? The author thinks so, but Evadne and Dorina Gray are highly opinionated young women. There are, as well, different types of happiness: contentment, rapture, and yet more dramatic forms… “transports of delight” as Dorina has probably exclaimed. The author believes we can all agree that this ending is not sad. Really, perhaps that is enough. We should all be so lucky as to live on a self-sustaining utopian commune full of aesthetes and intellectuals… or maybe not. It may be that someone in the sequel, Creatures of Want and Ruin, challenges that assumption, and fairly so. Regardless, that is another story for another day, cherished reader; for now, we must say adieu. If you enjoyed this novel, and would like to see io9 republish more novels in the future, please let us know in the comments.